In some ways this is an opportunistic dish because we don’t always see Radicchio in our grocer’s shop. We love the creamy, salty, bitter flavours which come together with the rich creamy sauce. We like serving it with a bit of Parmesan too, but it’s not necessary. Wine suggestion: The Rocca delle Macie’s Vermentino from the Maremma was our choice and the crisp, almost sappiness, helped to cut through the richness and complement the bitterness of the radicchio. If we’d had one we would have loved to have tried a good, dry Lambrusco from near Bologna. We could be wrong but think this might work too. Cook the pasta in a large pan of boiling salted water according to the timings on the packet. Heat 1 tbsp of olive oil and fry the onion until softened, then add the radicchio and continue to cook until wilted. Add the white wine and season. Pour in the cream, melt in the gorgonzola and mix through the cooked pasta. A dessert and a cheese course all at once, solving the problem of which goes first. This is really delicious Autumn dish. Make sure you serve the creamy gorgonzola at room temperature. Marsala is a dessert wine from Sicily which is relatively easy to find, it also works well with figs – see Roast Figs with Marsala. Wine Suggestion: naturally the Marsala from the recipe is a great match, look out for Florio or Pellegrino amongst others. Alternately a really good Sauternes emphasises the honey or a white Maury brings out the pears and all will work well with the Gorgonzola. Heat the oil in a large frying pan, then fry the pears for 3 minutes per side. Mix the Marsala and honey together, add to the pears and allow the mixture to bubble furiously, then transfer to a plate. Add the walnut halves to the juices left in the pan and stir-fry for about a minute or until browned and sticky. Remove from the pan and scatter over the pears. 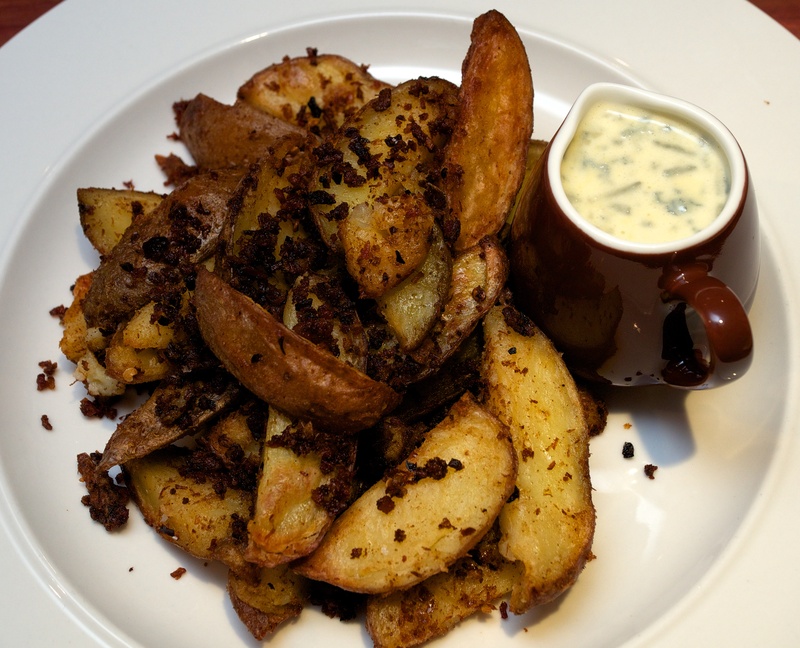 Serve with the creamy slab of Gorgonzola on the side. We’ve been away all weekend, so after 2.5 hours in the car we needed a tasty treat: this delivered the goods really well and was quick and easy. The recipe is from our favourite pasta book, The Silver Spoon: Pasta, which never ever fails. Conchiglie’s great for creamy sauces as all the cheesey goo gets caught in the shells. Put the pistachios into a heatproof bowl and pour boiling water over. Leave to stand for 3 minutes. Drain well and rub the skins off with your fingers – don’t burn yourself! Chop the kernels and set aside. Cook the conchiglie in plenty of boiling, salted water until al dente. Meanwhile put the Gorgonzola and the cream into a small saucepan and stir constantly over a low heat until smooth. Set aside until your pasta is done. Drain the pasta and tip into a warm serving dish. 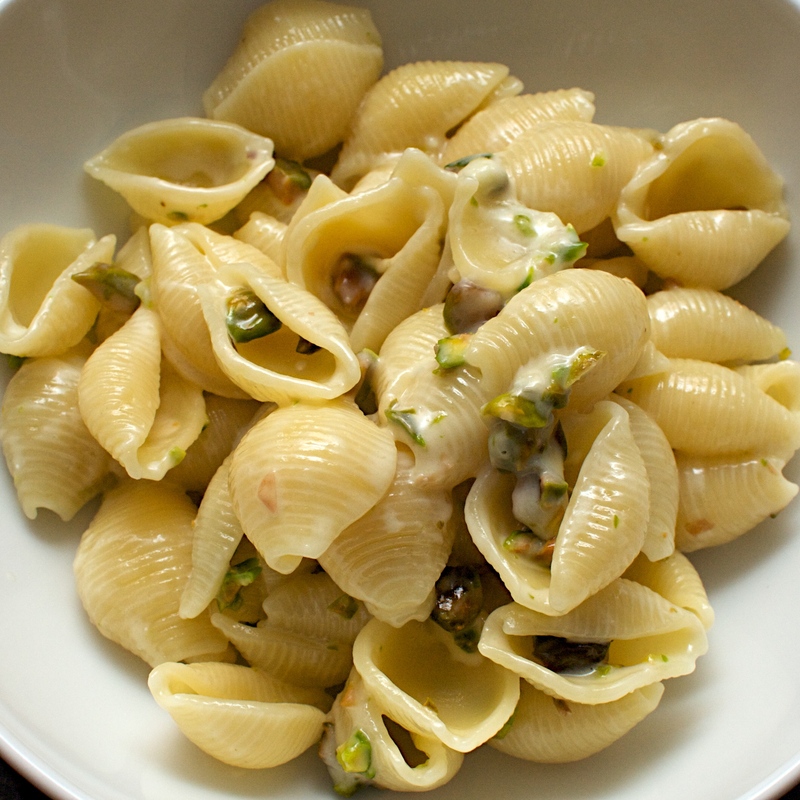 Toss with the melted Gorgonzola, chopped pistachios and Parmesan. Wine Suggestion: If we’d had one we would have drunk a Greco di Tufo with this – a full-bodied but crisp and minerally white from southern Italy. It also has a nutty character which would compliment the pistachios nicely.